With Spring here going out for a run is looking more and more appealing. Though just getting out there and hitting the pavement is tempting a little precaution is always a good idea. 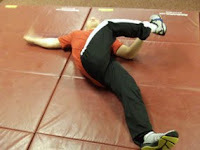 Flexibility training is an excellent way to improve performance and prolong your running future. 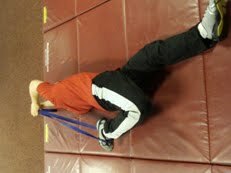 Though I am huge fan of any form of flexibility training Band Stretching is by far my method of choice. The muscles are designed to be elastic in nature just like a rubber band. When muscles are fatigued they lock up and lose their elasticity. This starts off as soreness and can lead to chronic pain and overuse injuries. 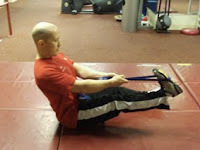 Using dynamic stretches with the band excites the nerves and restores the rubber-like properties of your muscles. This is a great place to start. How and where your foot hits the ground will dictate your stride. Ideally your calves act as a shock absorber and propel your foot up under your hip. If they are tight they pound into the ground and your joints pay the price. Keeping them lose can fight off nagging aches and pains (ex: plantar fasciitis, shin splints). It is very rare that I meet a runner who doesn’t have tight hamstrings. In a good stride your entire body helps out. When the hamstrings are tight they can’t lengthen properly and take a beating every time your place one foot in front of the other. Give your hammies a break by reminding them exactly long they are supposed to be. Does your back ache when you run? Do your legs feel like lead when you run? This can be caused by tight quads and hip flexors. When these muscles are tight they pull down on the front of the pelvis. This in turn causes undue pressure on your low back. Tightness in these areas also inhibits the hips from doing their job. This leads to heavy legs as you plod down the road. Keep the hip flexors and quads loose to run faster and more fluid. When the hips lock up this causes all sorts of troubles for your back and knee. Before things get out of hand get those hips back into working order and stay on the road running free. This is the marvelous post that I have come over after huge searches. I am really thankful to you for providing this unique information about band flexibility exercises for runners. Gait Analysis - Why Do I Care About My Gait?